Say "buh-bye" to the deluxe Jersey McMansion! 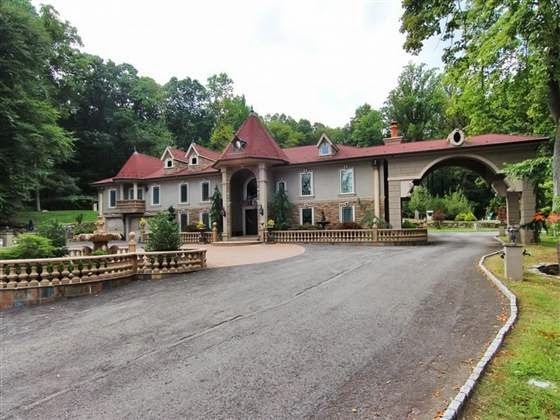 With their federal case sentencing just around the corner, Teresa and Juicy Joe Giudice have done what they probably should have done years ago: they have listed their gaudy Franklin Lakes home for sale. The Real Housewives of New Jersey stars are knee deep in some shyt in case you forgot (read more here). The couple has taken a plea deal and sources believe Teresa will get probation while Joe will most likely be locked up for at least two years. Teresa will be a single mother while Joe is away, so she really doesn't need a 6,500 square foot home. The home is worth about $1.2 million, but in typical Teresa fashion, they have listed the residence for $3.99 million dollars. I wonder how much of that money will be used to pay off their debts? The couple is scheduled to be sentenced on October 2nd, and I don't know what I would do if Tre gets locked up. I can't stand her lying azz sometimes, but she's my favorite on the show! I can't even see myself watching the series anymore if she's not there. How about you? What do you think about Teresa and Joe putting their Franklin Lakes Home on the market?